of the emperor himself in 1219, and Nürnberg became a free imperial city. basis for future development was laid. dissolved, and the oligarchic element remained in power. Treasure Box." By the middle of the sixteenth century, the city was almost completely Protestant. The Diet of Nürnberg, 1532, gave religious freedom to all and remained neutral in foreign affairs. 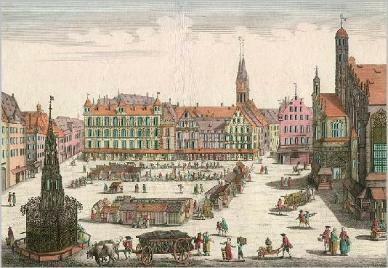 Nürnberg and published many important astronomical charts. detail. Nürnberg was known for its beautiful workmanship and objects of fine quality. caused by bickering sovereigns helped the city declined in wealth and influence. During the Thirty Years' War it did not always succeed in preserving its policy of neutrality. irreparable damage to the city. The population, which in 1620 had been over 45,000, sank to 25,000.
considered one of the greatest achievements of German art. about 1,200 and of St Aegidius. and 80,000 books, some of great rarity. cobbler-poet, and Johann Palm, the patriotic bookseller who was shot by order of Napoleon in 1806. Stations, seven pillars bearing stone reliefs of the Passion which ranked among his finest works. Theodore, appropriated part of the land and Prussia also claimed part of the territory of Nürnberg. twelve and a half million guldens.